Mozart thought particularly highly of the K452 Quintet, and so he jolly well ought. Even in the vast orchard of Mozart's greatest music, this is a particularly rich-tasting fruit. It's full of warmth and wisdom, the like of which you'll not often find in other 28-year-old composers. Its ever-resourceful scoring is perhaps its greatest asset, bringing to mind the wonderful 8-instrument C minor (K388) and 13-instrument B flat (K361) Serenades, the ornate wind writing in the later Piano Concerto slow movements, and in Così fan tutte. Thematically and melodically, it's as memorable as anything he wrote: and harmonically, it's a feast, the slow movement containing some of Mozart's most romantically chromatic meanderings. (My weaker students often suggested that Mozart was 'predictable' - but no one in their right mind would offer a prize for guessing the destination of these harmonic mystery-tours!) A particular claim-to-fame is its cadenzas, written out, of course, for all instruments in the ensemble! The coupling here is logical, and widely adopted in rival recordings. 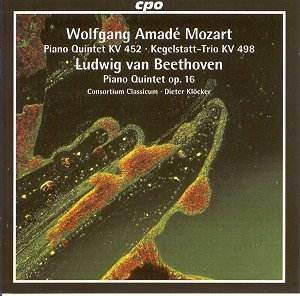 Beethoven's Quintet follows very much in Mozart's wake. But, bearing in mind that Mozart matured rapidly, and Beethoven slowly, and that it was written at the age of 26, you'd be right to expect the Beethoven to be more of a young man's piece. And so it is, with its playful gestures and loudly assertive statements. Although nowhere as sophisticated or as reflective as the Mozart, it's a confident and well-crafted piece, which well exemplifies this early stage of the composer's stylistic journeying. The uniquely-scored Kegelstatt Trio is added to this reissue to make up the minutes. And, charming piece that it is, and containing as it does all three of Mozart's favourite instruments, it's both welcome and appropriate. It comes last on the disc, by the way. I'd not come across these particular recordings before, having lived unquestioningly with the celebrated Perahia/ECO Sony disc these last 30-odd years. This being near-perfect, I'd made the fatal mistake of assuming that no one else could add to it. But Consortium Classicum are fine musicians, and the ADD recordings are clean and natural. The CD sleeve insists that K452 is in F flat major, by the way. An interesting typo, which (sorry!) only technically-minded musicians will be able to fathom. Not much music ever ventures that far on the flat side of C, though I can think of some..., and of course only ever en passant. Eight flats? One wonders what psychological properties Mozart - who always associated particular keys with particular emotions, and 'remote' keys with 'remote' emotions - would have assigned to such a key!